If you want to discover more ‘Instagram-worthy’ spots in Paris, check out our Paris Museums Guide where we share beautiful museums and hidden cafes! 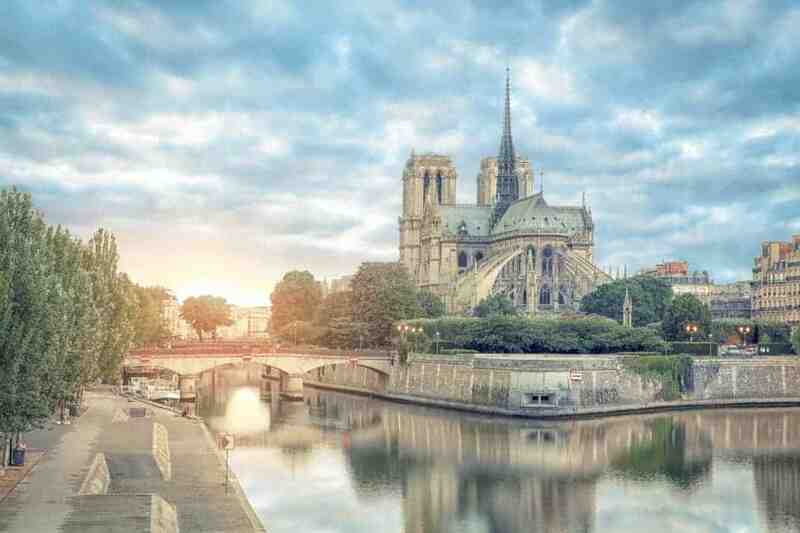 Paris is one of the best backdrops for beautiful scenery, and postcard images of narrow paved streets, colorful doors, Haussmann buildings, and overall best views in Paris. You can never run out of new paths, and perspectives to see the city from. As much as it’s nice to take in mental pictures of Paris’ beauty while living in the moment, who are we fooling? Everyone wants to find those picture-perfect places to get a canon image of best views in Paris. So here is a La Vie Locale’s curated list of Best views in Paris: TOP 10 Instagram worthy views in Paris (not listed in any particular order of preference). For more Instagram perfect trip ideas in Europe check this article about the most instagrammable spots of Lisbon, Portugal. You can have Gargoyle views of Paris’ landscape from the top of Notre Dame’s towers. When you’re facing the church, there is an entrance on the left side to access the towers. This is the most rewarding view you will get to Paris. The entrance to access the dome of the Sacré-Cœur is on the left-hand side of the church. After hiking up 300 narrow steps (no elevator), you reach the top and you’re greeted by 360° views like this. Galeries Lafayette department store has a beautiful terrace, that is open to the public, free of charge. Arrive just before the sun goes down for beautiful sunset views. They also have a bar and restaurant that is open when the weather permits. This is an awesome place that is crowd free and a calm place to enjoy a view overlooking Paris. If you enter the Centre Pompidou Museum, ask where the George restaurant is. The restaurant in itself is super pricey, but you can access the views without eating in the restaurant which is priceless. Last year I had the chance to visit the Montparnasse tower with other photographers in Paris during an Instagram meet up. We arrived right before sunset, check out the view all the way up from the 56th floor (highest building in Paris). If you are looking to see an unique view of Paris, visit the Paris Ballon, it floats 150 meters up in the air, and you have a flying view of Paris. The rooftop terrace of this boutique hotel is open to the public for their restaurant (reservation only) and bar. All glass windows + a panoramic view of Paris = pure bliss. This is a great place to see the perfectly lined boulevards. Great views at night when Paris is all lit up. You have to walk up 234 steps and you can see for miles. You have your choice between three locations all with different views of the city. There is the Perchoir Marais, with views of the Eiffel, la Seine and Notre Dame. Perchoir near Ménilmontant with views of Parisian rooftops. And you also have the choice of newest Perchoir Gare de l’est that opened Summer 2016. The view isn’t from that high up, but you have a nice view of the boulevards of Paris from the top of Gare de L’Est train station. NOTE: The biggest challenge with going to any of these places is, the lines are super long. You have to get there right when they open to lock in spot. All of the previous views are from high perspectives. If you want to see Paris from a different perspective, the Seine river cruise is a good occasion to see the city from the water. The large clock at Musée d’Orsay is a very popular photo spot while visiting the museum. Located right next Trocadero, this museum may be a little easy to miss, as crowds are flocking to take pictures of the Eiffel tower. If you want a two-in-one experience, take a visit of this museum which is dedicated to discovering the human species, and take in a great view at the museum’s restaurant (the killer view that overlooks the Eiffel Tower-no lines, no crowds).